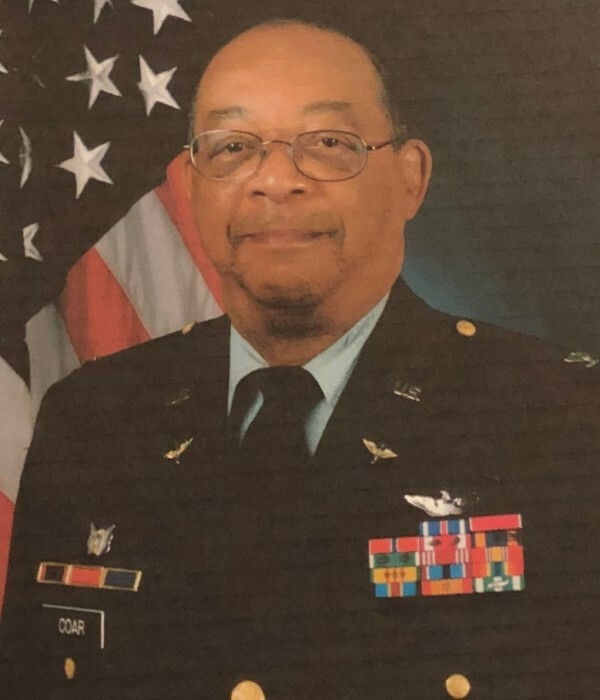 Funeral Services for Colonel James Andrew Coar will be held on Friday, February 01, 2019 at 2:00 PM at Andersonville National Cemetery 496 Cemetery Road, Andersonville, Georgia. Colonel James Andrew Coar, born November 17, 1943 in Columbus, Georgia, to Mary Lee Epps and Master Sargent James William Coar. His parents and a sister, Nettie Nichols, preceded him in death. He made his departure from this earth on January 28, 2019 to be with his Heavenly Father. He attended Mother Mary Mission during his early years in Columbus, Georgia and later graduated from Spencer High School also, in Columbus, Georgia. He further studied at Albany State College, in Albany, Georgia receiving a BS degree. Later, he received a master’s degree in mathematics at Georgia State University in Atlanta, GA.
As a child and as an adult he traveled extensively. He bravely served for thirty years in the United States Army. He attended The Industrial College of the Armed Forces, and the National Defense University, Ft. McNair, Washington DC. His military career as a commissioned officer earned him the title of Armored Cavalry Officer and Army Aviation Officer. As an Attack/Utility Helicopter Command Pilot, he was assigned to foreign military allies and countries in Egypt, Jordan and Saudi Arabia. He received many honors, decorations, awards and citations. Most notable of which were The Legion of Merit, Distinguished Flying Cross, Bronze Star, Air Valor Medal twenty-two combat Air Medals, Vietnam Cross of Gallantry w/Gold Star, Senior Aviator Wings, and an Army General Staff Badge, while serving under General Colin Powell. He retired in 1995 with a rank of Colonel/06. His skills and experience later led him to work as project manager of the Jobs Corps program at the Charleston Naval Base in South Carolina. He finalized his career as Athletic Director at Towers High School in Decatur, GA. Though his life was immeasurable and extensively broad, he was a humble man. He never wanted to elevate his status above others. He followed the teachings of his Catholic religion. He was a member of Saint Juliana Catholic Church in Fort Valley. His participation in the Catholic Cursillo prepared him for his journey to heaven. James was an avid reader of Medieval, Roman and Gothic stories, as well as Shakespearian poetry. He was a strategic planner which he applied in his career and in his life. James is survived by: his wife, Janza Hilson Coar of Fort Valley, GA, stepsons, R. Landon Harris (Teria) of Brookhaven, GA and Sherwin Harris (Feltrina) of Fort Valley, GA. Two daughters, Alicia Coar and Ashley Coar of Baltimore, Maryland. Four grandchildren, Jasmine Coar, Chamori Robinson, Jazalyn Harris and Jace Harris, one great-grand child, Andrew Coar, favorite cousins, Leon and Pete Inglesol, Omega Phi Fraternity brothers, and a host acquaintances and friends, are left to carry on remembrances of him.